Janine Barchas, author of Matters of Fact in Jane Austen, points out that in addition to Jane’s wit, intelligence , humor, and creativity in penning her novels, she associated her fictional characters with famous British families. For the contemporary Regency reader, the Woodhouses, Fitzwilliams, Wentworths, and Dashwoods were the celebrities of their day. In choosing famous names, Jane Austen ramped up her readers’ interest in her fictional characters by associating them with notable names, places, and events. 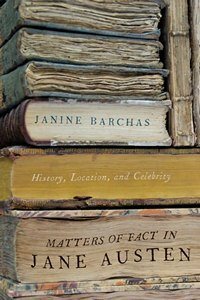 In her book, Barchas examines genealogy, history, and geography and comes up with some fascinating information that has recently surfaced via online documents and texts. I had always assumed that Jane pulled names out of a hat, or picked them for how well they fit the character. (Mr. Wickham for the charming villain, Mr. Knightley, who is kind and good and a bit of a knight in shining armor.) According to Barchas, that is not necessarily the case. Take Northanger Abbey, for instance. Among Bath’s wealthiest residents n the 18th century were the Allens from Prior Park, a grand and beautiful Palladian mansion that was visible from #4 Sydney Place, the house in which the Austens resided before Rev. Austen’s death.